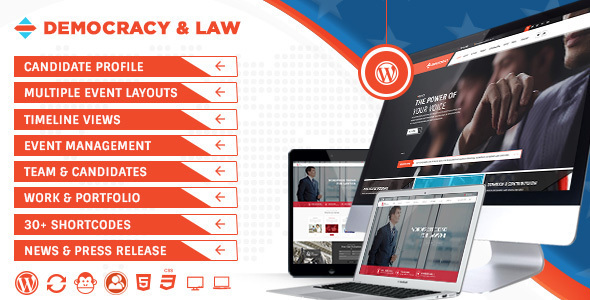 Democracy Political – Lawyer WordPress Theme Created by kodeforest. This templates have specific characteristics, namely: Democracy Political WordPress theme designed specifically for political and public figures like politicians, candidates, nominees and leaders. .
You can use this Democracy Political – Lawyer WordPress Theme on WordPress category for biography, candidate, democrat, diplomacy, elections, issues, law agency, law associate, law firm, lawyer, political campaign, politician, politics, republican and another uses. Its allow your visitors to get immersed in your content with full screen images, parallax video backgrounds, elegant typography and animations. With a few simple tweaks and changes you can manage your site from a serious campaign presentation to a more informal grass root political movements. Try it and tell us how you feel about it. Democracy WordPress theme comes out standing and dazzling functionality to manage your nonprofit Polticial org. and political campaigns. Democracy political WordPress theme is actually political campaign’s hub. You can add unlimited campaigns in every possible options for it and manage all you. Powerful Admin panel – We have greatly extended initial WordPress admin to provide you with more functionality that includes a wide variety of options and settings and provides maximum customization flexibility to help you create a fantastic corporate, campaign, fundraiser, political, social, crowdfunding, election or Lawyer website. Democracy WordPress theme offers you the opportunity to never touch a single line of Html again and deal with tons of messy codes. With elegant xpress page builder, you can create beautiful and elegant layouts easily. Valid code and optimized structure is one of the key points for a successful website that will be successfully crawled and indexed by search engines. By Democracy WordPress theme you can easily manage all events without any technical skills. Mange all events date, schedule, venue, timing, contact information and all that you want to manage for events. Democracy theme providing the flexible functionality and a better opportunity to manage democracy every team member on the base of job, qualification and experience with there candidate profile. Democracy theme providing the best portfolio options and services for your democratic and political events where you can show your detailed portfolio information easily. Democracy Themes come with flexible and stunning design which adjust itself on all type of screens. It has best responsive sliders that work smoothly on mobile and tablets. Democracy WordPress design is dedicated to mobile that looks awesome on your mobile and tablets too. Democracy theme comes with 5 popular slider plugins included, Nivo , BX , Flex , Layer and Revolution Slider, all have supreme functionality and breathtaking effects. No need to purchase them, it’s all in! Democracy has an optimized code and structure, as well as fantastic compatibility with the SEO famous plugins, allowing you to easily add important SEO meta data to all your website content.Your Candidate will win! you can set a custom background for any page and post on your website, as well as define in for the whole website in general. Choose colour or image background and set repeat type and positioning to it. Democracy theme by KodeForest is a WordPress themes completely translation ready, so it supports free or premium plugins, like and WPML. Using these tools you can translate everything: pages, posts, menus, taxonomy, etc. Democracy is fully integrated with the BBpress forum. BBPress is focus on the ease of integration, ease of use, web standards and speed. It can be easily install on your site. : Images used in the demo are not included in the download package because they are purchased from shutter stock and we do not have there reselling distribution rights. They are used for demo purpose only. The Events Calendar PRO addon does not have license that allows theme authors include it in the theme archive, so you will need to purchase it separately. HAVE FEEDBACK’S? KEEP THEM SENDING TO US!